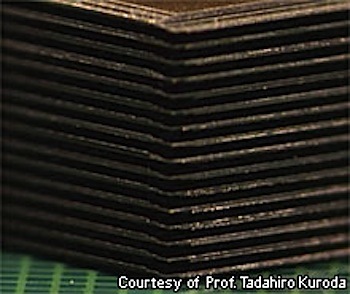 A one terabyte solid state drive prototype has been demonstrated by Tadahiro Kuroda and researchers from Toshiba and the Keio University in Tokyo. When manufactured next year, it is expected that they will be cheaper per Gb and more energy efficient by 70%. They created a 1 Terabyte solid state drive prototype the size of a small postage stamp, consisting of 128 NAND flash memory chips and one controller chip. The miniature storage device boasts transfer speeds of 2 Gbps, and also uses radio communications which will ultimately make it cheaper to manufacture. SF fans have been encouraged to dream of high-density computer data storage; consider the Schrön Loop from Dan Simmons' 1989 novel Hyperion, which could carry "entire planetary dataspheres". From Nikkei via Next Big Future.